Geocritical Explorations: Space, Place, and Mapping in Literary and Cultural Studies (New York: Palgrave Macmillan, 2011). In recent years the spatial turn in literary and cultural studies has opened up new ways of looking at the interactions among writers, readers, texts, and places. 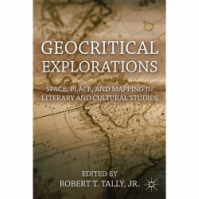 Geocriticism offers a timely new approach, and Geocritical Explorations: Space, Place, and Mapping in Literary and Cultural Studies presents an array of concrete examples or readings, which also reveal the broad range of geocritical practices. Representing various areas of literary and cultural studies, as well as different parts of the globe and multiple types of space, Geocritical Explorations provides a succinct overview of geocriticism and a point of departure for further exploration. Contents: Foreword by Bertrand Westphal; Introduction: On Geocriticism – Robert T. Tally Jr.; Part I. Geocriticism in Theory and Practice; 1. Geocriticism, Geopoetics, Geophilosophy, and Beyond – Eric Prieto; 2. The Presencing of Place in Literature: Towards an Embodied Topopoetic Mode of Reading – Sten Pultz Moslund; Part II. Places, Spaces, & Texts; 3. Redrawing the Map: An Interdisciplinary Geocritical Approach to Australian Cultural Narratives – Peta Mitchell & Jane Stadler; 4. Textual Forests: The Representation of Landscape in Latin American Narratives – Maria Mercedes Ortiz Rodriguez; 5. Land of Racial Confluence and Spatial Accessibility: Claude McKay’s Sense of Mediterranean Place – Michael K. Walonen; 6. The Shores of Aphrodite’s Island: Cyprus and European Travel Memory – Antoine Eche; 7. Jefferson’s Ecologies of Exception: Geography, Race, and American Empire in the Age of Globalization – Christine M. Battista; Part III. Transgressions, Movements, & Border Crossings;8. Geopolitics, Landscape, and Guilt in Nineteenth-Century Colonial Literature – Rebecca Weaver-Hightower; 9. “Amid all the maze, uproar and novelty”: The Limits of Other-Space in Sister Carrie – Rachel Collins; 10. Furrowing the Soil With His Pen: Derek Walcott’s Topography of the English Countryside – Joanna Johnson; 11. Global Positioning from Spain: Mapping Identity in African American Narratives of Travel – Maria C. Ramos; 12. The Space of Transgression: A Geocritical Study of Albert Camus’s “The Adulterous Woman” – Brigitte La Juez; 13. Affective Mapping in Lyric Poetry – Heather Yeung.